I must admit, during the previouse years i have always been to the alpine region in the winter. A nice season to explore the ski slopes and snowy landscape, but now i have realized, it does not make any justice to the gorgeous Lake Bled. Swimmers happily enjoing the warm lake, teenagers were sup-ing around, children were jumping up and down the meadows that sourand the lake, all of it made it just alive. Enchanting with its setting of deep green forests while embracing the lively lake, it shines like a jewel. The vibrant colors of different green shades will marvel and relax your sight at once, before even embarking on the lake with the traditional wooden boat for the visit of Bled island. Pletna boat is a traditional wooden boat that is manpowered. Its traditional design and the selection of only the best raw wood, mostly larch, due to its consistency, are skilfully made into a light and shiny lake boat. 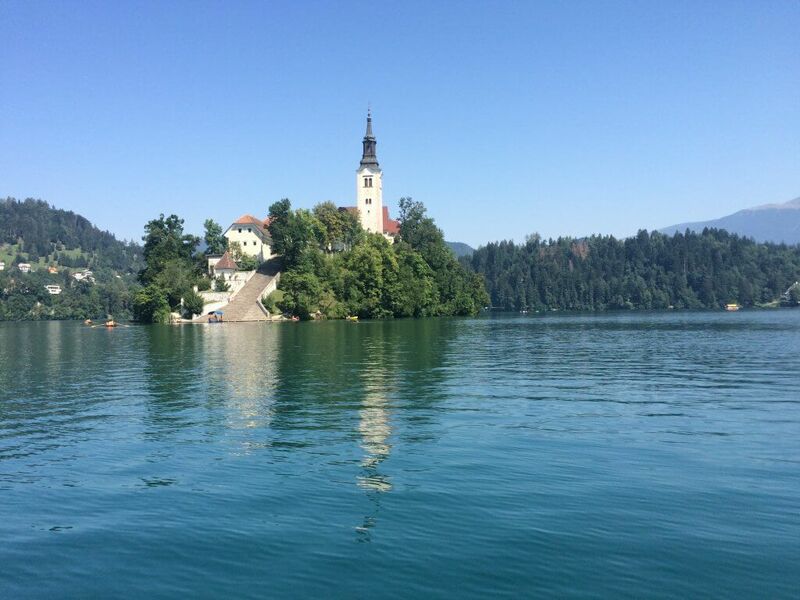 The sail to Bled island is an experience for every visitor. It offers you a different perspective and feel of the ambiance. Visit of the island gives you a few options. One of them is the visit of St. Mary’s Anusumption church where you can find the bell of wish. Its sound is like a background of notes in an arhythmic sequence that makes it special in its own way. Once in the baroque church you are free to make your secret wish and ring the bell three times. It also happens that sometimes it just doesn’t ring. The bell tower offers the option for a nice climbing exercise, after which the rewarding view makes you forget the climb. For a taste of Slovenia’s national festive cake, called potica, you can head to the showroom, where every day they bake the traditional cake respecting the culinary recipes from past generations. Sweet or salty it is your choice. We tried the poppy seeds potica, chocolate, fruit and terragon potica, nut and rasins potica and almond potica. All were deliscouse and make us taste a small part of a festive day. After the culinary treat you can easily start your walk towards the embarkation point, either by descending 99 stairs or a nice walk around the island. Last leg of your journey will be a peaceful return sail towards the mainland. The visit of Lake Bled can be combined with your visit either on a cruise line or enjoying a discovery of Slovenia on your own. Contact us if you would like to make your shore excursion to Lake Bled or simply explore the lake area with professional guides during you multiday tour of Slovenia.